When the replacement body arrives my DM should take his place as best TK and one of my top 3a ever. Any ideas when to expect replacements or will they slot into the schedule meaning 2016ish? expect somewhere around a year or two. Just received a pair of HT Zod boots I picked up on ebay to try on my Death Mask. They are cartoony big (not in a good way) and don't fit the pegs. Thought it would be a good idea but fell short. Anyway, I now have a pair of cool boots for something else, maybe I'll try a separate custom Heavy to go along with my pair of slicers. Has anyone gotten their tomorrow or nothing T shirt with the grenade container. Have not seen anyone post an image of the item. chiowhon wrote: Has anyone gotten their tomorrow or nothing T shirt with the grenade container. Have not seen anyone post an image of the item. Was more orange than red in color. No prob just curious as to how it looks. Another day closer to getting the Loper/Bot head! I still can't believe its been a year. so when is the loper/bothead shipping? The canister is nice except it's way bigger than 1:1 it should be the size of an aerosol but instead it's about the size of a bucket. 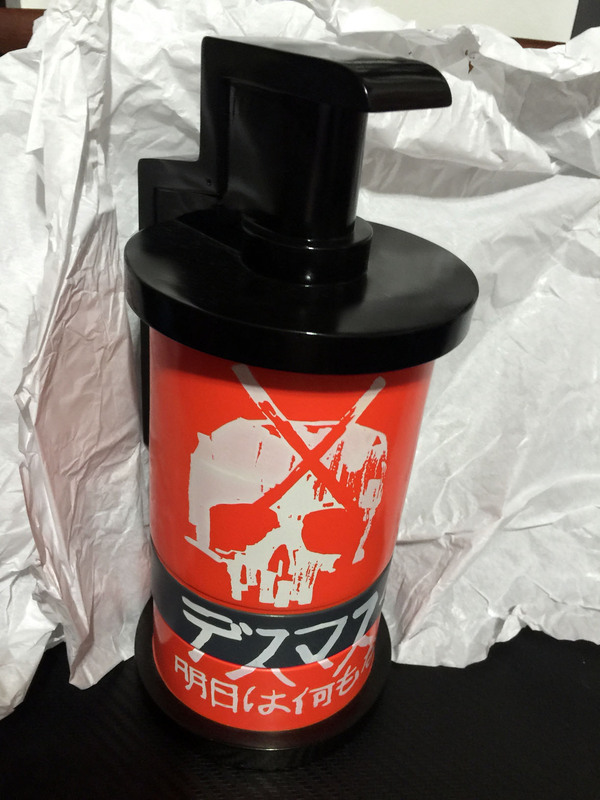 Also DM was supposed to come with these canisters in 1:6 but his were changed to black. So in fact these are not 1:1 DM grenades in any way at all. Having said all that I do have one myself and they do make nice display pieces. Were any of the previous grenades/canisters 1:1 or are they all oversized? So it's early Nov now, how many think Loper will be shipping in late Nov early Dec? Will be ship in ThreeA time called "soon"
and as described timeline in ThreeA. Yes, got mine mid November. I also got a tracking number from cs beforehand. Any update on DM floppy body replacements? Anyone receive an email to that effect. A friend of mine got a similar email about getting a free replacement head, then that's very cool for you guys but what about guys who received a floppy DM Slicer and are still sitting tight watching premades being pumped out? So "IF" this is true, what happens when the next one arrives broken? It was really about the way they packaged it for shipping that made it break. Unless they change the material it was made from or completely retooled the way they ship it, they will continue to break in shipping. Is the above true? Threea sending out replacement body and headsculpt? Location : Headlong into the irresistable orbit.